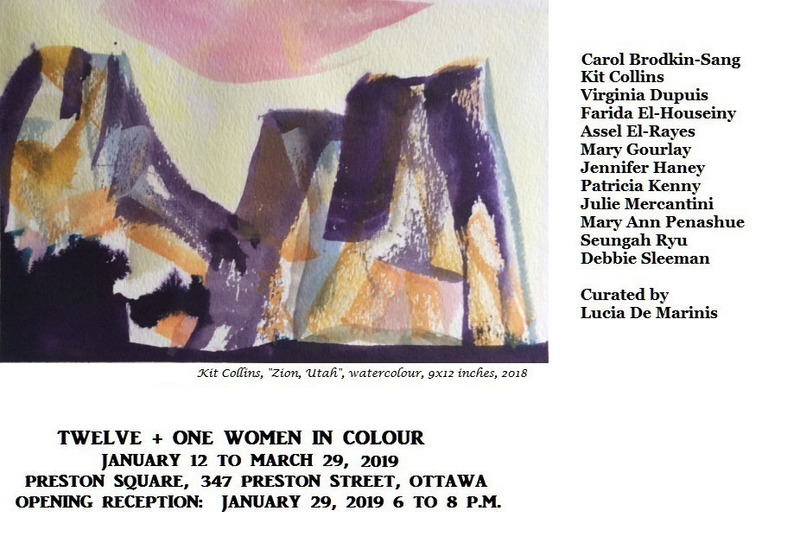 Patricia Kenny is part of a group exhibition, Twelve + One Women in Colour curated by Lucia De Marinis at Preston Square, 347 Preston Street, Ottawa. Opening reception is January 29, 2019 from 6:00 to 8:00 p.m.
Patricia’s second current show is at the Blackburn Library, and is called Wilderness Within. The Blackburn Library in conjunction with Arteast is proud to present an exhibition of acrylic mixed media paintings by Patricia Kenny. Patricia explores transformative experiences universal to the human condition, interwoven in our lives as life-altering events. Influenced by her experiences, with materiality and spontaneity in process, she expresses in vibrant, surrealistic and abstract works themes of vulnerability, resilience and rebirth. Location: Blackburn Hamlet Library branch of the Ottawa Public Library, 199 Glenpark Dr. Ottawa K1B 5B8. Hours: Mon. through Thurs. 10 – 8:30. Friday 1 – 6:00 and Sat. 10 – 5. Closed Sunday.